This miniature toy sailboat for a dollhouse is carved or filed and sanded from a scrap of leftover craft wood. The sailboat can be made in many designs with many sail patterns once you learn how to carve or shape the simple hull. The design can be modified to make sailboats in smaller scales and can be modified to make small boats for bottles. If you will be using the sailboat in a bottle, or won't need to see the keel for any reason, you can shape your boat hull with a simple flat bottom the boat can sit on. 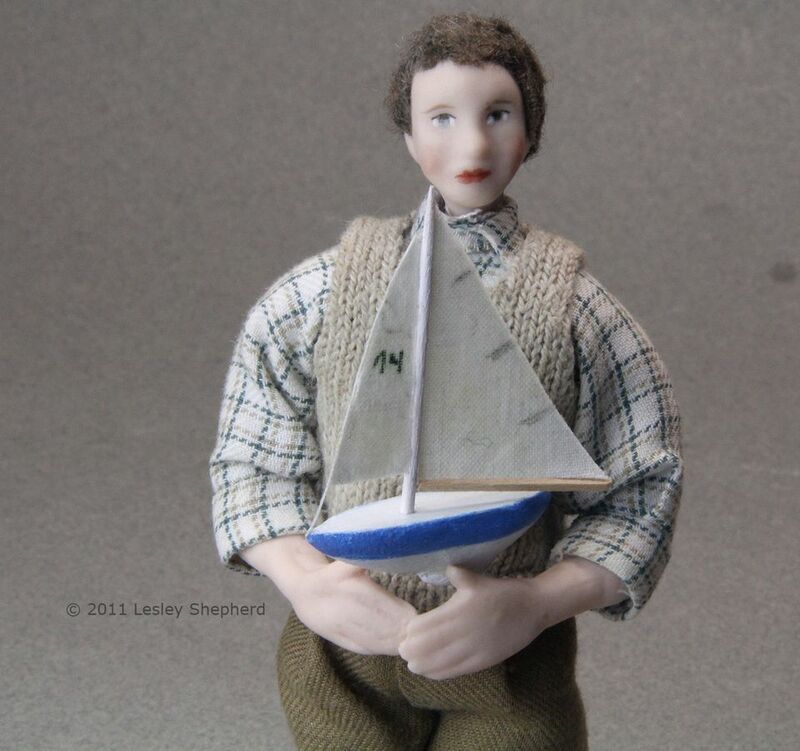 The keeled sailboat will need to be 'stored' in a rack if you want to put it in a dollhouse toyshop window, or use it as a display in a dollhouse child's room. This makes a good first carving project if you work in at least the scale shown here (1:12 dollhouse scale). Another simple carving project is the Carved Rope Molding which can be carved on a round toothpick. A scrap of Square Stock Craft Wood - I used a 1 1/4 inch length of 3/8 inch square stock basswood to make my dollhouse scale boat. Do not use a soft wood like Balsa. Cut the length to just under how long you want the length of your boat to be. Round Wooden Toothpick - this will be cut down to become the mast. A scrap of Thin Cotton Fabric - For the sails, you will need a piece of thin, worn cotton or cotton lawn roughly 2 inches (5 cm) square. Needle Files - not essential but useful. Craft or Carving Knife - or craft knife. If you are going to carve the boat hull, rather than file and sand it, you should protect your fingers with carving tape and make sure you have sharpened your carving knife (see the last item on this list of carving tools). Sandpaper - I used medium and fine sandpaper for wood. Sewing Thread - use black or tan if possible for the rope lines on the sails. Take a piece of scrap paper the size of one side of your scrap of wood, and draw a rough shape for a miniature sailboat. One end should come to a narrow point at the bow, and the other end should be slightly deeper and square at the end to form the stern. If you are going to put a keel on your sailboat, make your shape roughly triangular, but don't bring the shape on the end of the keel to a point. See the photo for example. Study photographs of various sailboats and keels to see how you want to set your sailboat up on your particular sized scrap of wood. If you don't want to have a keel, you can draw a bow and stern for your miniature sailboat hull. Use a fine pencil to transfer the rough shape for the sides of your hull onto both sides of your scrap of wood. Make sure you have the bow on the same end of the wood scrap on each side. Draw a line down the middle of each end of your wood scrap, and a line on the top and bottom to mark the center. You can mark the top deck shape of your hull now (see next step) or after you have the sides of the boat rouged out. When you have the center lines and the side shape marked, use a carving knife or a craft knife, or files, or even a sanding block and coarse sandpaper, to take away the wood under the point of the bow and the stern. (see photo). Don't worry about rounding your hull in this step, take away the extra wood in front of and behind the keel, leaving the rough outline of your paper pattern. To make the pattern for the upper deck shape on your miniature toy sailboat, cut a scrap strip of paper the same size as the top side of your miniature boat blank, and fold the strip in half. Use sharp scissors to trim one end to a point at the fold, and trim the other end to a wide curve. Unfold your scrap of paper. Your deck design should be similar to the one shown in the photo. Lay your paper pattern on the deck surface of your boat blank and draw around it to mark where the edges of the deck will be as you carve your boat hull. Use medium coarse sandpaper wrapped around a brush handle, or other round handled tools, to shape the rough hull of your model sailboat keel. Work on rounding the ends, according to the layout of your deck outline, and round the sides down to the base of the keel. Use fine sandpaper to finish sand the rough shape every once in a while to make sure there are no large bumps or dips. Use a pencil to draw a small oval for the shape of the base of the keel on the bottom of your miniature sailboat, roughly centered in the area you have roughed out on your hull. (see photo). If you are using a carving knife, draw a line with the knife along the line you have set for the base of the keel, and gently start to carve up into the hull around the keel, leaving the keel as a "post" on the base of the hull. Cut down the line you have drawn, then carve away a bit more of the hull on the sides of the keel, then cut down the shape of the keel, and carve more away on the hull. The keel will be a narrow band, slightly back from the center of your boat, which widens at the top to join the keel to the hull. When you have the rough sides of your keel-shaped on your hull, use medium and fine sandpaper to smooth the hull into its final shape. Use sandpaper wrapped around a toothpick to work on the edges of the keel where it joins the base of the hull. You want the keel to be sharp on the front and back edges, and along the base, flowing smoothly out to join the sides of the hull. Depending on the size you are making your miniature toy sailboat you will need to make a mast by tapering a piece of very fine wooden dowelling or a round wooden toothpick. In the photo on this page, the toothpick beside the sandpaper is unchanged, while the toothpick beside it has been thinned and tapered to form a miniature mast. Use medium sandpaper on a small sanding block made from a scrap of wood to taper you wooden toothpick to one of the pointed ends. Turn the toothpick as you sand, and check the shape often to make sure your toothpick is tapering to the point and has no bulges on the sides. You want a mast which is as straight as possible. When you have the toothpick roughly to shape, you must use fine sandpaper, or a fine nail file or needle file to sand the toothpick to its final finish. When your hull is complete, and your mast is tapered, mark the location for the base of your mast, depending on the sail pattern you will use to add sails to your boat. I am using a single mast and triangular sails, so I have set my mast roughly one-third of the way back from the front of my boat. Pick a mini drill bit the same size as the base of your mast. Center your mini drill squarely above your hole, at right angles to the deck (unless you want a raked mast) and drill a short hole into the center of your deck, roughly 1/8 inch deep. Test fit the base of your mast into the hole before proceeding further. Remove your mast from your toy sailboat and use it to determine the size of sails you will need. The sails should reach almost to the top of the mast, and the angled front and back edges away from the mast should line up roughly with the point of the bow and the stern of your sailboat. It may be easier to draw and cut out a paper pattern before you try cutting the sails from fabric. When you have the correct shape and size for your sails, cut scraps of fabric to size, one for a mainsail, the other for a jib or foresail. I used a fine pen to number my foresail, like the toy boats children sail on the pond in the Luxembourg gardens in Paris. You can also use a fine pencil to draw lines for the sail battens if you wish on the outer edge of the mainsail. (see photo). When your sails are the correct size, paint them with a layer of PVA glue thinned with water, and allow the sails to dry. If you prefer you can use fray check to prevent the edges from fraying. I used a scrap from a percale sheet to make my sails. You can make finer sails from cotton lawn fabric, or you can use tissue paper for sails if you prefer. Depending on the size of your toy sailboat you can cut a thin strip of craft wood, or make a strip from a stir stick, and fit it to your mainsail as a boom. In smaller scales, you can use bristles or some other stiff, round material to make a boom in a suitable size. To make the boom, use a steel ruler and a craft knife to cut a thin strip of craft wood the length of the bottom edge of your mainsail or slightly longer. Sand the stripwood carefully to round the edges, or you can sand them square if that is easier. Use a folded piece of sandpaper to sand one end of the strip so it has a slight cup shape that will fit against your round edged mast. Apply a thin bead of glue to the forward edge of your mainsail (the edge at right angles to the base of the sail) and press the sail up against the mast. Leave to dry. When the sail is glued securely to the mast, run a bead of glue along the bottom edge of the sail, and set a small amount of glue on the end of the boom where it was shaped to fit the mast. Glue the boom to the mast and the bottom of the sail. Allow to dry. When the boom is securely glued to the sail and the mast you can trim the boom to length if necessary. While the mainsail and boom assembly are drying, you can paint the hull of your toy sailboat. I suggest you use gloss paint or colored varnish to paint your hull. Paint the deck of the ship white, or add a flat or semi-gloss clear coat to the deck. If you are using a clear coat or varnish, you may want to draw fine lines for 'boards' on the model ship deck. The hole you drilled for the mast will take the end of a round toothpick which can act as a 'holder' while you paint. Finish the sail assembly by running a thin bead of glue with a pin, along the upright straight edge of the front sail or 'jib.' Press this gently against the mast, lining up the top edges of the jib and the mainsail, or setting the jib slightly below the mainsail. Put some PVA glue on your forefinger and thumb and run a short length (3 inches) of sewing thread through the glue, twisting the thread between your finger and thumb to coat it. Press the thread against the front sail or jib, so that the thread starts on the mast, and follows the upper edge of the sail down to the front of the sail. Leave the thread to dry on the sail, keeping the extra thread hanging off the front of the sail as shown in the photo. Finish the toy sailboat by placing a tiny bead of PVA glue into the hole you drilled on the deck and set the mast into the hole. Set the mast as straight as you can, or facing back slightly. Check that the thread is securely glued to the front edge of the jib, and apply a tiny dot of glue to the very top of the deck at the front (bow) of the boat. Glue the thread coming from the sail to the front of the boat. Trim the extra thread away once the glue has dried. The sailboat can now be set in miniature scenes. If you want to make a stand for your sailboat so it can sit upright on a dollhouse table or desk, take two thin sections of craft wood or pieces of stir stick, the length of your sailboat keel, and hollow out a U shape on one end of each strip using files or sandpaper. You want the "U" to cradle the hull of your sailboat. When you have the "U" end correctly shaped, cut a separator slightly longer than from the front to the back of your keel. Glue the pieces with the U's to the separator, so that the U's face up, and the three pieces make a sort of upside-down bench. Allow the assembly to dry thoroughly. You should now be able to set your sailboat into the cradle as a stand. If the boat is too heavy for the cradle, you may need to glue rails to hold the top end of the front U to the top end of the back U on either side of the cradle.